When a patent changes hands an assignment may be recorded at the USPTO. Because patents are often assigned many times over their lives, it is useful to be able to query the most recent assignment date. Use the ANRE_EXE_DT field code to query patents by their most recent assignment execution date. As with other date fields you can use it with a date range or a single date. ANRE_EXE_DT:[NOW-1YEAR to NOW] --> Finds patents that have a recorded assignment event in the past year. 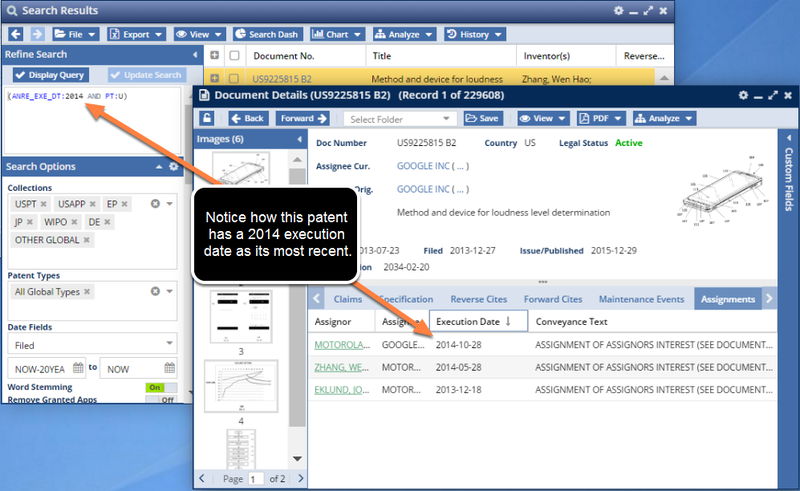 ANRE_EXE_DT:2014 --> Finds patents that have their most recent recorded assignment event in 2014.